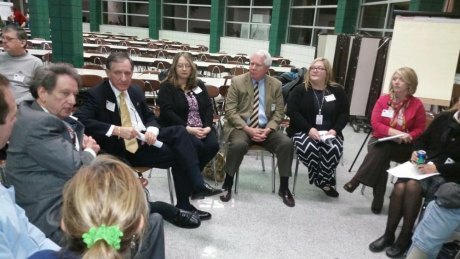 Reminiscent of the "Our Jobs, Our Future" and the Arts Summit, over 100 Huntington residents came to the Huntington High School to discuss improving the city's economy. The diverse participants included elected officials, such as members of Huntington City Council, the Board of Education and members of the Williams administration, along with business leaders. Format similar to a strictly moderated "Chat n Chew" , "What's Next Huntington" sought input on strengths of the city and ways of improving so that young generations have favorable job opportunities. One HHS teacher asked class members to attend, which worked exceptionally, by integrating age gaps and injecting high spirited youthful ideas into the discussion. For a gallery of photos from the event, click below.